Researchers in the west of Scotland have developed an artificial intelligence system that can automatically recognise different types of cars - and people. Among its many possible applications are robots with better eyesight - and drones to spot defects in buildings before they collapse. It is the result of a collaboration between the University of the West of Scotland and the French multinational electrical systems group Thales. It is based around the concept of "deep learning" which mimics the way human brains behave to create an artificial intelligence that learns on the job. From the distance, a vehicle is approaching. But what kind of vehicle? At Thales UK in Glasgow, they have long been able to make systems like this that can see in the dark. But this one can do much more. On a display screen there is a moving image. Given that what we are "seeing" is heat, it is not exactly HD. But while my eyes may be struggling a bit, it is good enough for the system to know what it islooking at. Thales' head of algorithms and processing Andrew Parmley explains what is going on. "The image itself is actually quite small, so the deep learning neural network is identifying what it sees." A red box appears on screen, surrounding the image of the vehicle. A label alongside says "bus". This is spot on, as what appeared at first to be a van turns out to be a people carrier. The bus door opens and a shape emerges. Near-instantaneously that shape is given its own box - this time blue - and the label "person". As the person walks around the van, blue box and label follow. It is the product of a neural network. As the name suggests it is a digital imitation of the way our own brains work. "It is a collection of neurons, synapses, which have been trained - which have been shown a lot of images which are like that van," Andrew Parmley says. "You show it maybe a thousand images in different orientations and it has learnt what that van looks like. "So when you show it a van from a different viewpoint it says 'I've seen something like that before'." It is the result of a collaboration with the University of the West of Scotland. Its senior lecturer in signal and image processing Dr Pablo Casaseca explains his side of the partnership: "We brought in a unique aspect of the system, which was trying to enhance the quality of the image using super resolution methods. "The problem in this specific project was to detect objects which were very small in the images. "So we thought we would need to apply methods to increase the resolution or the quality of the objects in the image." 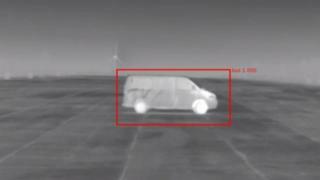 The defence applications of the technology are obvious: who is driving that van towards me - and do they mean me harm? But it has the potential to go far beyond that. It could be trained to spot which person in a crowd is running a fever. Mounted on a drone, it could spot cracks and other defects in bridges and buildings. The concept underlying this technology is deep learning: a computer's neural networks learning on the job. Willie Alexander, the technical director of the optronics business of Thales UK says deep learning is nothing less than a revolution. "What deep learning gives us - and gives anybody in the imaging business - is the ability to let the software look at the image and know what it's looking at. "If we had an image of this room at the moment, the software would say 'person - table - cup - pen'. "It knows what's in the image, and that is a revolution that is driving autonomous cars. "It's a revolution that's changing the world and everybody in industry - people who are designing things in Scotland - need to be aware. "They need to use it because the world is changing." The matchmaker between the university and Thales was CENSIS, Scotland's Centre of Excellence for Sensor and Imaging Systems. It is one of eight innovation centres backed by the Scottish Funding Council to foster closer collaboration between academic researchers and industry. Craig Fleming, senior business development manager with CENSIS, is proud of what is being achieved here. "This is one of the projects I started when I first joined CENSIS and it's really great to see it come through now. "It's really exciting and it tells other companies to engage with the academic community because I think it can really help them and accelerate their own R&D activities and help them grow as a business." Having examined potential applications themselves, the team are now finding new ideas are coming to them as potential customers seize on the possibilities. We may even see robots become fruit pickers, able to tell the difference between a strawberry and a leaf. The system may not be able to do that just yet. But it will learn.